Once again, Out Now with Aaron and Abe is delivering another bonus episode. With everyone so busy, yet apparently filled with ideas for episodes, the thought of doing an episode based around the TV shows of 2011 came up. 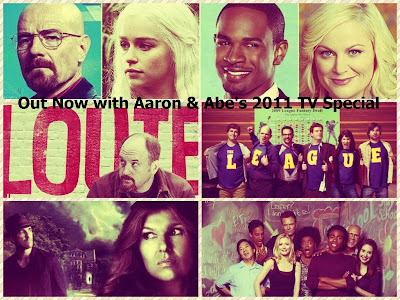 With Abe sitting this one out, Aaron joins up with guest writer/reporter Jonathan Van Dyke to go over a large batch of notable television series, which were on during the year. The episode is divided into topics including new shows, shows that got better, shows that got worse, cancelled shows memorial, and best/favorite shows. It is an incredibly packed episode, which doesn’t even cover all of what Aaron and Jon wanted to talk about. Still, they guys give it their best shot and talk about a lot of quality TV programs.